Are you looking for Just a Barrel? Sometimes you are looking for just a used barrel. Whether it’s unfinished, straight from the distillery or whether you are looking for a finished barrel to go in just the right spot you’ve been thinking about, we can help. 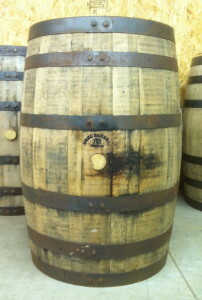 We have raw barrels and finished barrels. Our raw barrels are cleaned and branded but are kept in their original condition just as we receive them from the distillery. All of our used whiskey barrels keep their straight-from-the-distillery stains and markings that reinforce their authentic appearance. Because we choose not to sand or remove the distillery marks, every barrel is different. 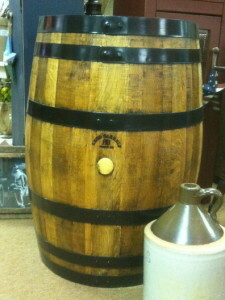 We use the same great barrels for our finished barrels but we also clean, paint and secure the rings. As with all of our finished barrel products, we coat everything with a double coat of marine grade spar varnish. We try to keep all of our products in stock. Most of our inventory on site is finished with a Clear Satin, Marine Grade Spar Varnish. 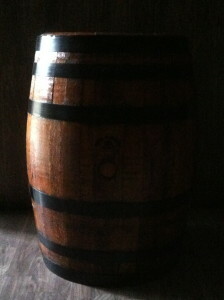 We use Cabot brand and suggest you use the same when it comes time to refinish your barrel. If you would like to order a barrel stained to your color preference, we are happy to work with you to meet your specific requests.